When the elite of Jerusalem and Rome came under pressure from an obscure Galilean carpenter turned preacher it was bound to end in tears. Sheer ruthless crushing brutality was the order of the day but it is still very disturbing. Human beings do horrible things to each other. They also influence each other to do horrible things, which may be worse. Christ was born into a cold-blooded world, his family fleeing from the King whose son’s officials would eventually nail him to the cross. The Christ of resurrection had scars. He was not unaffected by the journey from Bethlehem via Egypt, Capernaum and Samaria into Jerusalem. Rejected, betrayed, denied, misunderstood, misrepresented and mocked with a thorny crown. As Jesus of Nazareth cleared the temple he reopened the way for scarred humanity to reach the healing love of God. As he rode the donkey, walked the streets, knelt at the feet of his friends with bowl and towel and received the kiss of the traitor he absorbed the polluting force of human indifference, connivance and rebellion. Today you and I can worship like Thomas, John and Peter the scarred risen Christ. Through him the majestic awe inspiring God beyond eternity comes near. Not just as holy but also as compassion. Hope that is just wishful thinking means very little but the scarred power of hope that is revealed in Christ is life enhancing and life changing. Out of the darkness comes light. The light is not overpowered by the darkness; rather it discloses something breath-taking and magnificent. God is for you. God is for me. God is for all. His scars bring healing. 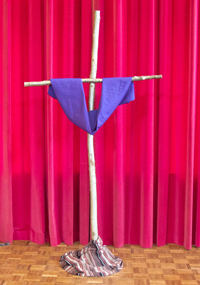 you may download a copy of the booklet A Gift of Easter from the Methodist Church website.